oSTEM members sit outside the Student Union on Wednesday. oSTEM members said the club can reach a different demographic that LGBTA events cannot. The club, oSTEM, is recognized by the School of Engineering and Applied Sciences and has 112 chapters at other universities, including Stony Brook. SA insists the club’s purpose “duplicates” the purpose of LGBTA, founded in 1970, which caters to LGBTQ students. Students are struggling to understand SA’s decision and insist that, while the clubs overlap in that they cater to LGBTQ students, there are differences in their focuses. The biggest difference is that o-STEM is geared for STEM students and offers professional development-focused meetings and events. Buynovskiy said if SA “really wanted to follow its strict rules," it would have to disband a number of its interest-focused minority clubs. He said the decision could potentially affect other minority clubs. Most clubs, he said, would think SA should recognize oSTEM. oSTEM members learned SA would not recognize them in a Friday email from SA Vice President Anyssa Evelyn. In the email, Evelyn wrote o-STEM’s purpose would “directly duplicate” LGBTA’s. In addition to Evelyn, a prospective club’s council coordinator (in oSTEM’s case, Academic Council coordinator Anthony Taboni) and one of two SA pro-staff members decide if clubs will get recognized by SA, according to the SA club handbook. Evelyn did not reference oSTEM in her email to The Spectrum on Tuesday. Evelyn also did not comment on oSTEM’s insistence that it differs from LGBTA and its goal to represent LGBTQ STEM majors at UB. SA President Gunnar Haberl said that the recognition process is solely the vice president’s responsibility. He said he had not been involved in the decision or did not hear any complaints. “There have not been any student requests [for] a meeting with me to discuss establishing oSTEM within the Student Association,” Haberl said. The clubs do share similar goals of inclusivity. LGBTA is “an organization which is sympathetic to” the concerns of LGBTQ students, according to its club constitution. oSTEM’s purpose is to foster a “safe environment for the inclusion of LGBTQ” people in STEM at UB, according to its constitution. Other schools have not found the overlap a problem. Stony Brook recognized oSTEM this semester and found no conflict with LGBTA, which it also recognizes. oSTEM members said they’ve been working for SA recognition since 2015. That’s when club founders approached SA and applied for recognition. Priya Persaud, a junior aerospace engineering major and o-STEM member, said SA rejected the club’s request in 2015. Persaud said the club wants more university recognition and the ability to apply for funding. Evelyn, in an email to Buynovskiy on Friday, wrote that oSTEM could contact LGBTA and see if it was willing to allow oSTEM to be an LGBTA subcommittee. Persaud did not find that comforting, since the club has roughly 30 active members. More broadly, she worried for the future of additional LGBTQ clubs at UB. “It could be disappointing for [students] if LGBTA was the only LGBT organization that SA ever allowed,” Persaud said. Persaud said oSTEM members presented a document to SA officials that explained the goals similar to and specific to both clubs. The document oSTEM presented to SA described “organizational redundancies within SA,” including SA-recognized organizations, such as the Black Student Union coexisting with the National Society of Black Engineers and the National Black Law Student Association’s Pre-Law Chapter. Evelyn wrote that she has no control over past SA e-board club approved/denied recognitions. “I think just because we’re LGBT doesn’t mean we have the same workplace issues, it [can] depend on what field you fall under and that’s basically what we really want to get people to know,” Giron said. Persaud said oSTEM means a lot to her members and being an LGBTQ person in STEM is a more “complicated” topic than what could be covered in LGBTA meetings. She said the benefits are “clear” for SA to recognize oSTEM alongside LGBTA. “Even if they don’t reconsider our application, we just hope that in the future for other clubs that may have this issue, that SA won’t do this and there’s an ability for other LGBT clubs to exist,” Persaud said. 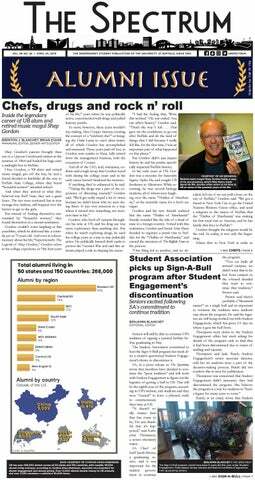 Benjamin Blanchet and Brian Evans are editors and can be reached at arts@ubspectrum.com.